I’ve been running workshops since 2016. I really enjoy introducing people to working with glass (warning, glass is addictive! ), passing on hints and tips about the processes, and sharing tea, cake and laughter in my studio! (please message me if you would like to book a date not listed). I am thrilled to have received lots of lovely glowing reviews through www.craftcourses.com. This fantastic directory of craft courses in the UK also offer gift vouchers which I am happy to accept… a great way to gift a craft experience to a loved one! Super course. I’m not naturally very creative and was definitely a novice but with Jenny’s help and patience I made some pieces I am really proud of. The glass works was an amazing place to be, we were made to feel very welcome. Cannot recommend highly enough. Apply your own permanent designs to glassware using stencils and corrosive cream. Create beautiful gifts, seasonal decorations, and fun yet functional household items. I’ll share lots of hints and tips so that you can continue to use this process at home. £30p/p, £54 for two. Please contact me for availability. 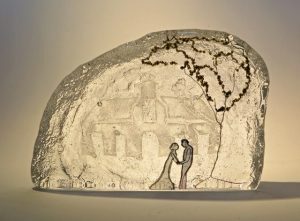 I’ll begin the session by introducing a range of simple techniques to create and apply your own stencil design, then demonstrate the use of glass etching cream. For the standard 3 hour sessions you will each be provided with a 20cm circular mirror and a tumbler. Additional items will be available to purchase on the day (£1-£4 each), better still please bring along your own glassware (charity shops and recycling bins are great places to look for inspiration!). Chemical etching creates a permanent opaque surface, ideal for decorating functional items as they may be washed and heated to the manufacturers’ original specifications. Once you know the basics this is a technique that can be further explored at home. Etching cream is a particularly great way to transform plain household items. These sessions are suitable for all, from the super creative who can cut their own designs, to those less artistic who would like to use pre-cut stencils. The youngest participant to date was 7, she chose and applied stencils to apply her name and a picture to a glass tumbler and a glass jar. All under 16’s must be accompanied by a participating adult. I’m a big believer in creativity being connected to a happy tummy… so there will be tea and cake provided. If you have any dietary requirements please let me know in advance. Create your own wire models and encase them in molten glass. This is a great introduction to molten glass without the physical demands of glass blowing. 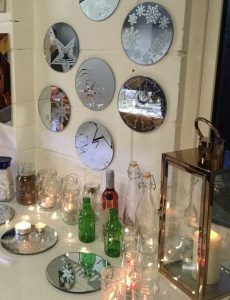 Previous participants have made extra special bespoke wedding, anniversary and birthday gifts, plus beautiful artworks to keep for themselves! £350 p/p, £600 for two. £100p/p deposit, remainder payable 1 month before course. Please contact me to check availability. We’ll spend day one in my studio planning and creating the wire models for your designs. Day two will be spent in the hot glass studio, where I will show you the sandcasting process, and then you get to cast three of your very own artworks. The pieces will all go into the lehr to anneal (cool at a controlled rate). I will return to the studio the following week to collect our creations, and grind the bases. I will then post them to you to arrive about three weeks after the course. Tasty lunches and delicious cake are included in the cost of the course. There is a risk that not all pieces will survive the annealing process, however by casting three you should have at least one good’un, and if you’re lucky you may even get three (I work at about a 90% success rate, unfortunately this is one of the risks of working with glass). Over 16s only. Under 18s to be accompanied by a participating adult. Please contact me using the form below to check on availability. Let me know if you have any access or dietary requirements so that I can ensure that you’re catered for. If the dates listed don’t work for you, or if you would like to like to arrange for a workshop for a group of friends/family/colleagues then message me!